The Upper Caves connect both to the warrens and the spawning grounds. The warrens have tunnels that end in a swamp. No problem – I soon had rumors of “smelly men” and “toad men” to be heard in the town inn, shepherds needed help with their sheep being stolen during the night, and so on. The town is also by the sea shore, so I had various fishermen following the cult of the crab. The first few sessions, there were some encounters vaguely related to the dungeon. One player’s newly bought dog was taken by a giant crab and dragged into a cave. Inside, two more giant crabs killed the priest and scared the players away. In another encounter the party was attacked while traveling through and one of the toad men broke the elf’s arm (Death and Dismemberment for the win). A few sessions ago, however, the party decided to investigate some more and found an entrance to the warrens. There, they started talking and got a superb reaction roll. In the end, one of the characters did some cave paintings for the troglodytes. Then they heard about the king’s treasure and wanted to see him. They started realizing how big the dungeon was with pits, unsafe areas, guards, patrols, lizards, toad knights, and more. They spoke with the king and promised to take care of the crab-men. In the meantime, the other party had organized a strike force of twenty mercenaries in order to root out the cult of the crab. They entered the spawning grounds from the sea and ended up in the cave men temple, killing practically all of the worshippers. Thus, when the first party was led to the spawning grounds, they hardly met any cave men. No treasure, either. Instead, they met a giant, freed a mad man, killed some scavenging crabs, sold them to the giant, and so on. Finally the giant told them more about the cave men, the crab men, the boy that kidnaps cave men, and so on. They decided to retreat and heal. This required them to find their way back through the upper caves – and nobody had drawn a map! That was very exciting. They did manage to return to the warrens with their troglodyte allies where they rested. They were attacked by a giant badger, heard of the two remaining giant badgers, and decided to get their treasure. The plan they hatched involved cooking the first badger in its own skin in order to gain a lot of badger oil, which they then used to light a big fire and scare the remaining the badgers away. After looting the cave, they returned and found the two giant badgers attacking their troglodyte allies and fought them, too. In short, it was awesome. They loved the waterfall flowing upwards and thought about trying to dive in. They loved the invitation to the fungus god summoning ritual and participated heartily (sponsoring it with four hundred badger sausages). I think we will be playing here for a while. Hey, awesome! Glad you’re enjoying it. A fellow called “Hackman”, who did a good job, actually wrote level 1, though Dave and I helped with the level. 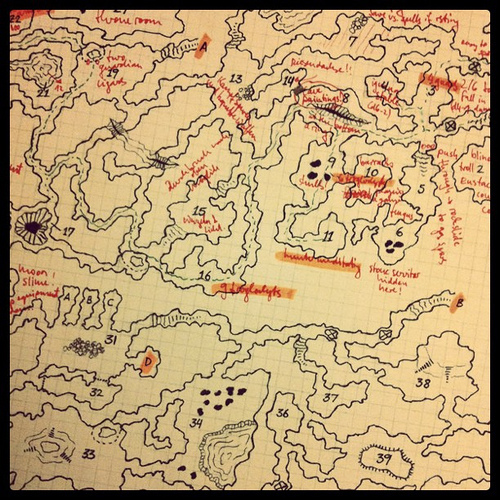 I think Dave just did the map for level 2, but level 3 is his contest winner, and a very fine piece of work.